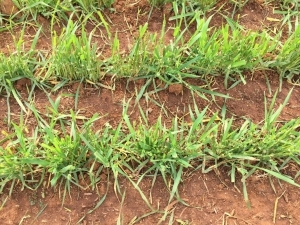 It is a common practice amongst many Dookie farmers to sow a paddock of barley early in the season (around mid-April) and use the first flush of growth as valuable sheep grazing during the winter feed deficit. The crop is then locked up at GS30 growth stage and allowed to go through to grain harvest. At the start of 2018 season, GrainSearch provided local Dookie grower Alan Shields with a tonne of Biere seed to evaluate how it would compare with Alan’s usual short season ‘grain&graze’ variety Mundah. Due to the dry conditions both the Biere and Mundah were sown in the same paddock, side-by-side in mid-May – about a month later than normal. When Alan first let his sheep onto the paddock to graze, he noted it did take a couple of extra days for the stock to move over to the Biere side of the paddock, but once they did, they grazed the paddock evenly from then. Again due to the very low rainfall season (the lowest recorded in Dookie’s history), Alan kept the sheep on right through to at least GS32 (possibly sacrificing potential grain yield for valuable sheep grazing). On our inspection of the paddock on the 15th October 2018, we were very pleased to see the paddock had recovered very well, with heaps of flowering heads in the crop. 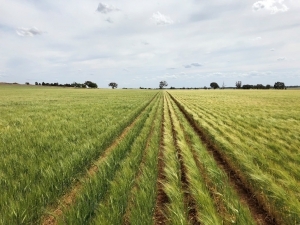 To complete the demonstration, the harvest grain yields will show if the fast Biere (a potential export malt grain variety) compares to the traditional fast speed Mundah barley (feed grain quality only). Image: Biere during grazing (grazing continued for 2 weeks after this photo was taken in August).